The ASA offers several flying site choices to its members. No matter where you fly, safety should be the primary concern. Ensure that no one else is flying on your radio frequency! The more "serious" members of the club fly at Evergreen Turf Farms, a lush green sod farm in McIntosh, New Mexico. It's about 8 miles south of Moriarty see map. The best way to find the sod farm is meet up with other club members for breakfast before the day's flying. Look at the postings on our list serve the night before a scheduled flying session to see who's doing what. Some members commonly stop for coffee or breakfast at the Village Inn on Juan Tabo near Lomas before traveling out to McIntosh to fly on weekends. Flying at the Sod Farm is a VERY SPECIAL privilege. We don't want to do ANYTHING to screw that up. For safety reasons, it is imperative that you hook up with the group that is going out there! 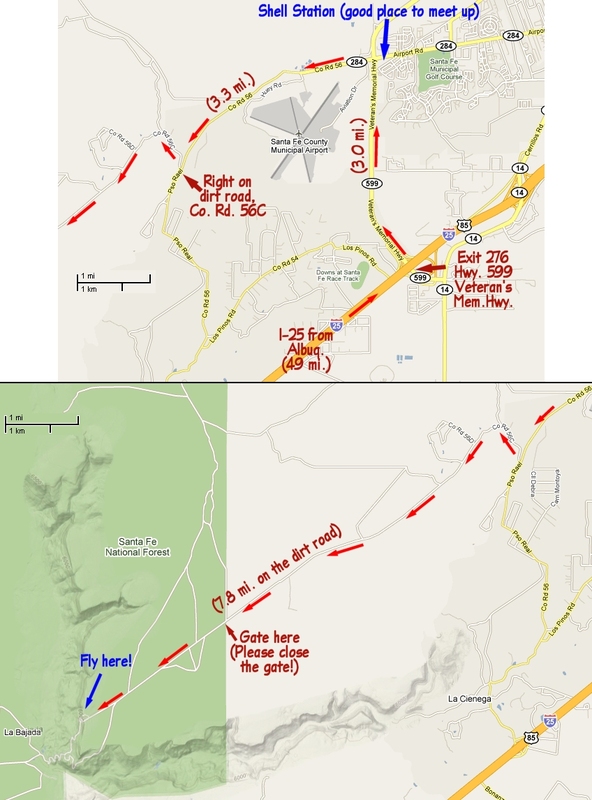 Go past the first exit for Moriarty and take the second exit, "Exit 196, Highway 41, Howard Cavasos Blvd." At 8.6 miles on the west side of the highway you will see a white house with a blue metal roof. This house is at the Otero Ave. intersection. Turn left (east) on Otero Ave. (a dirt road). Go one mile east on that dirt road to the white gate of Gardner Turf Farms. 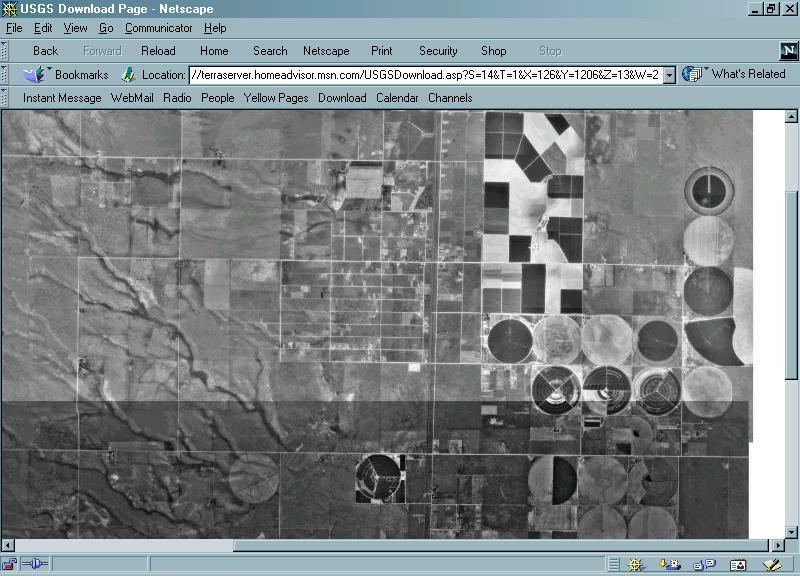 Continuing east, there are four irrigated sod circles, look for Sailplanes! If, traveling south on Highway 41, you get to the McIntosh Post Office, you've passed the Otero Ave. turnoff! Once you have reached the sod farm, you have to get inventive and look around and find where the guys are flying. There are 5 BIG sod circles there. Wind direction and what is being done with the sod farming operation will determine where we are flying. If you decide to fly by yourself (NOT RECOMMENDED! ), make ABSOLUTELY CERTAIN that you are the only ones there. We do not need to be "shooting each other down" with frequency conflicts! This is why we recommend that you hook up with the guys for breakfast. Better to be safe than sorry! Click HERE to see an aerial photo of the sod circles at McIntosh. Events at the Sod Farm include yearly contests for electric sailplanes (F5J) [with that linked to http://www.soarabq.org/f5j.shtml] and discus-launched sailplanes (Blue Skies over New Mexico) [with that linked to http://www.rcgroups.com/forums/showthread.php?t=1017689], informal club contests and "fun-flys", and a yearly club picnic. Our informal contests—usually Saturday mornings—include thermal duration (mostly launched using an electric winch), electric sailplanes, discus-launched sailplanes, and "Hiss 'n' Boink". The Balloon Fiesta Park is the largest park facility in Albuquerque. It's located west of the I-25 Frontage Road and north of Alameda. It offers a total of 94 acres of grass fields and paved roads that may be used as runways. Most weekday mornings, several club members may be found flying at the Albuquerque Balloon Fiesta Park. This is the same huge expanse of grass used for the hot air balloons and specifically the Albuquerque International Ballon Fiesta held every October. We share this site with other aircraft modellers. There are free-flight folks, electric power planes, and nitro and electric helicopters. The park is closed to us a couple of weeks before, during and a couple of weeks after the Fiesta and at other times when special events are scheduled. An access card is required to open the gate. Cards can be obtained at the golf pro shop at the south end of the field. The cost is $20 per year. There are some specific rules that will apply to all of us who fly at the Balloon Park in order to safely allow the use of the field for all types of RC flying. A pin-up board is centrally located, and its use is required for all RC pilots using non-2.4 GHz radio systems. Also, the City of Albuquerque has an official policy statement. During the times when the Balloon Fiesta Park is closed to flying, the weekday morning fliers usually divert to Manzano Mesa Park, just east of Eubank and south of the Costco that's a couple of blocks south of Central Ave. This field is big enough for a small high-start or you can fly electrics or hand-launch. 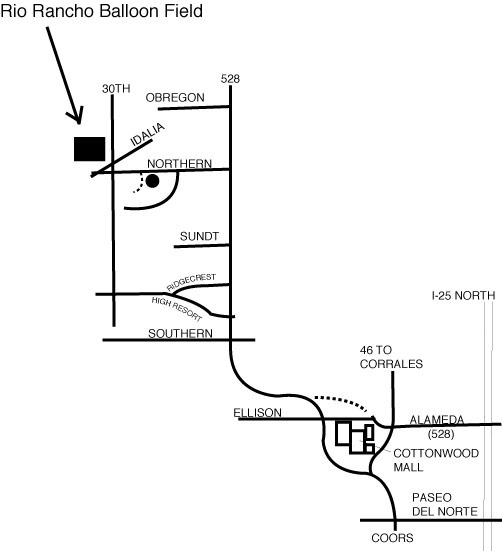 An alternative site is Arroyo Del Oso Park just southwest of Wyoming and Spain N.E. The soccer field there is also a primary playing field for the Youth Soccer Program and is not usually open to flying on weekends or sometimes on weekday afternoons after school. There are commonly members of other local model aircraft clubs who fly there (mostly electric park flyers)—be certain to coordinate radio frequency control with them. 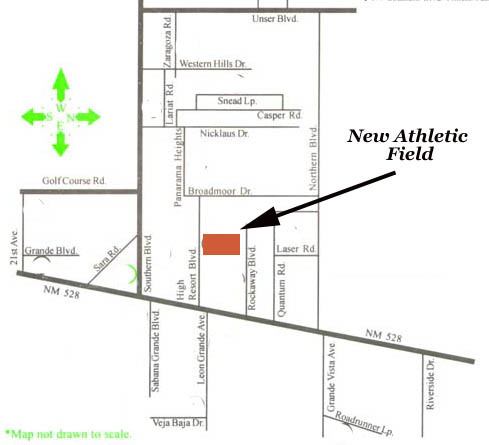 We also fly at the Rio Rancho athletic field which is about half-way between Southern and Northern Blvd. on High Resort west of Highway 528. Many Some of the club members fly here during the week. Be particularly careful that someone isn't also flying at the Rio Rancho Balloon Field above. The close proximity of these two sites makes radio interference a certainty if pilots are on the same frequency! This site is on U.S. Forest Service land so it should have public access. From the Big I in Albuquerque, take I-25 N toward Santa Fe. Take Exit 276, Hwy. 599, Veteran's Memorial Hwy. Turn left and go under I-25. Turn left (west) at Airport Rd./Hwy. 284/Co. Rd. 56 (stoplight). Turn right (north) onto dirt road Co. Rd. 56C (there is a road sign visible just after you make that right turn). Now comes 7.8 miles of dirt road. The dirt road will climb up a bit, circling around to your left. Then it will straighten out, heading generally southwest. Stay on that road toward the escarpment. 5.4 miles after you leave the pavement, there is a gate, wired shut. You will have to untwist the wire, open the gate, pass through, close and re-wire the gate. About 50 yards before the escarpment, there is a dirt track to the right. Take that dirt track to the flying site.